Voici la liste des références d'articles présentant des scénarios de mission martienne que nous avons pu établir. NB : Nous avons délibérément omis les articles datant des années 80 et avant. Voir l'article de Portree pour une synthèse de ces travaux. Brandenburg_A : J.E. Brandenburg, J. Kline, R. Cohen, and K. Diamante, MarsX : Mars in 10 years, Proc. of the 5th Mars Society Convention, Boulder, Colorado, 2002. Brandenburg_B : John Brandenburg, Mars-Phobos: A Mars Mission Architecture with Mars-Moon Synergy, proc. of the Space Technology & Applications International Forum (STAIF II), 12-13 March 2012. COMBINED_ELECTRIC_CHEMICAL_A : L. M. Burke, M. C. Martini, and S. R. Oleson. "A High Power Solar Electric Propulsion - Chemical Mission for Human Exploration of Mars", proc. of the 50th AIAA/ASME/SAE/ASEE Joint Propulsion Conference, Cleveland (OH), 2014 (AIAA 2014-3719). COMBINED_ELECTRIC_CHEMICAL_B : T. Percy, M. McGuire and T. Polsgrove, "Combining Solar Electric Propulsion and chemical propulsion for crewed missions to Mars," 2015 IEEE Aerospace Conference, Big Sky, MT, pp. 1-10, 2015. CALTECH : C. Hirata, N. Brown, D. Shannon, J.D. Burke, B. Murray, M. Adler (The Mars Society at California Institute of Technology), Mars SCHEME, 3rd Annual HEDS-UP Forum, May 4?5, 2000. CYCLER_ALDRIN : K.J. Chen, D.F. Landau, T.T. McConaghy, M. Okutsu, J.M. Longuski and E. Aldrin, Preliminary Analysis and Design of Powered Earth-Mars Cycling Trajectories, AIAA/AAS Astrodynamics Specialist Conference and Exhibit Monterey, California, 5-8 August 2002. ELECTRIC_A : K. Sankaran, L. Cassady, A.D. Kodys and E.Y. Choueiri, A Survey of Propulsion Options for Cargo and Piloted Missions to Mars, International Conference on New Trends in Astrodynamics, January 20-22, 2003. ELECTRIC_B : T.D. Schmidt, W. Seboldt and M. Auweter-Kurtz, Flexible piloted Mars mission using continuous electric propulsion, Journal of Spacecraft and Rockets, vol. 43 (6), 2006. ELECTRIC_C : R. Myers, C. Carpenter, High Power Solar Electric Propulsion for Human Space Exploration Architectures, proc. of the 32nd International Electric Propulsion Conference, Wiesbaden, Germany, sept. 11-15, 2011. ELECTRIC_VASIMR: A.V. Ilin, L.D. Cassady, T.W. Glover, M.D. Carter and F.R. Chang Diaz, A Survey of Missions using VASIMR for Flexible Space Exploration, JSC report 65825, 2010. ESA: L. Bessone and D. Vennemann, CDF Study Report, Human Missions to Mars, Overall Architec-ture Assessment, CDF-20(A), February 2004. GATECH : J. Christian, C. Tanner and J. Theisinger, A Revolutionary Outpost Architecture for Human Mars Exploration, proc. of the IAC, IAC-06-D1.1.7, 2006. IAA_A : International Academy of Astronautics, The International Exploration of Mars, 4th Cosmic Study of the IAA, April 1993. IAA_B: International Academy of Astronautics, The Next Steps in Exploring Deep Space, W. Huntress ed., July 2004. ISU : W. W. Mendell and V. Legostaev, International Mars Mission, Final Report of the 1991 ISU Design Project, International Space University, Cambridge, MA, USA, 1991. Mars Drive: G. Bonin, Reaching Mars for Less: The Reference Mission Design of the MarsDrive Consortium, 25th International Space Development Conference (ISDC), Los Angeles, California, 4-7 May 2006. Mars Society Australia : D.Willson et J.D.A Clarke, A Practical Architecture for Exploration-Focused Manned Mars Missions Using Chemical Propulsion, Solar Power Generation and In-Situ Resource Utilisation, Proceedings of the 6th Australian Space Science Conference, p. 186-211, 2006. NASA_90DayStudy : Report of the 90-Day Study on Human Exploration of the Moon and Mars, NASA, November 1989. NASA_DRM1.0 : S. J. Hoffman and D. I. Kaplan, eds., Human Exploration of Mars: The Reference Mission of the NASA Mars Exploration Study Team - NASA SP-6107 - NASA Johnson Space Center, July 1997. NASA_DRM3.0_A : B. G. Drake, ed., Reference Mission Version 3.0 Addendum to the Human Exploration of Mars: The Reference Mission of the NASA Mars Exploration Study Team - EX13-98-036 - Exploration Office, NASA Johnson Space Center, June, 1998. NASA_DRM3.0_B : S. K. Borowski and L. A. Dudzinski, Vehicle and Mission Design Options for the Human Exploration of Mars/Phobos using "Bimodal" NTR and LANTR propulsion, 34th Joint Propulsion Conference of the American Institute of Aeronautics and Astronautics, Cleveland, Ohio, 13-15 juillet 1998. NASA_DRA5.0_A : B.G. Drake ed., Mars Architecture Steering Group, Human Exploration of Mars, Design Reference Architecture 5.0 (and addendum), NASA Johnson Space Center, 2009. NASA_DRA5.0_B : S. K. Borowski, D. R. McCurdy and T. W. Packard, ?7-Launch? NTR Space Transportation System for NASA?s Mars Design Reference Architecture (DRA) 5.0, 45th Joint Propulsion Conference of the American Institute of Aeronautics and Astronautics, August 2-5, 2009. NASA DRA5.0_C : H. Price, A. Hawkins and T. Radcliffe, Austere Human Missions to Mars, AIAA SPACE 2009 Conference, Pasadena, 14-17 septembre 2009. NASA DRA5.0_D : G. Drake ed., Mars Architecture Steering Group, 2nd Addendum of the Human Exploration of Mars, Design Reference Architecture 5.0, NASA Johnson Space Center, 2014. Portree: D. Portree, Humans to Mars: Fifty Years of Mission Planning, 1950 - 2000, NASA Monographs in Aerospace History Series, no 21, February 2001. Raftery : M. Raftery, D. Cooke, J. Hopkins, B. Hufenbach, An affordable mission to Mars, Proceedings of the 64th International Astronautical Conference, IAC-13, A5,4-D2.8.4, Beijing, China,oct. 2013. Salotti_1 : J.M. Salotti, Simplified scenario for manned Mars missions, Acta Astronautica, vol. 69, 266?279, 2011. Salotti_2 : J.M. Salotti, 2-4-2 Concept for Manned Missions to Mars, Proceedings of the 62nd International Astronautical Conference, IAC-11-A5.4.11, Cape Town, South Africa, 3-7 October 2011. Salotti_3 : J.M. Salotti, Revised Scenario for Human Missions to Mars, Acta Astronautica, vol. 81, p. 273-287, 2012. Salotti_4 : J.M. Salotti, Robust, affordable, semi-direct Mars mission, Acta Astronautica, Volume 127, pages 235–248, oct-nov. 2016. SpaceWorks Engineering: B. St Germain, J.R. Olds, J. Bradford, A.C. Charania, D. DePasquale, M. Schaffer, J. Wallace, Uilizing Lunar Architecture Transportation Elements for Mars Exploration, proc. of the AIAA Space 2007 Conference, Long Beach, California, 18-20 septembre 2007. Tavana: Tavana, M., Zandi, F., Applying fuzzy bi-dimensional scenario-based model to the assessment of Mars mission architecture scenarios, Advances in Space Research, volume 49, issue 4, pp. 629 ? 647, 2012. Von Braun : Wernher von Braun, Manned Mars Landing, Presentation to the Space Task Group, NASA document, presentation materials, 4th August 1969. Weaver_A : D.B. Weaver and M.B. Duke, Mars Exploration Strategies: A Reference Program and Comparison of Alternative Archi-tectures, AIAA 93-4212, AIAA Space Programs and Technology Conference, September 21-23, 1993. Weaver_B : D.B. Weaver and M.B. Duke, Mars Exploration Strategies: A Reference Design Mission, proc. of the IAF 93-Q.1.383, 1993. Zubrin Mars Direct: R. Zubrin and D. A. Baker, Mars Direct: Humans to the Red Planet by 1999, proceedings of the 41st Congress of the International Astronautical Federation, 1990. Zubrin Mars Semi-Direct : R. Zubrin and D. Weaver, Practical Methods for Near-Term Piloted Mars Missions, AIAA 93-2089 AIAA/SAE 29th Joint Propulsion Conference, Monterey CA, 1993. Scénario fortement inspiré de Mars Semi-Direct, avec comme principe général d'envoyer sur Mars un vaisseau cargo et un véhicule de retour dont les ergols sont produits sur place avant l'envoi du vaisseau habité. On envoie ensuite un gros vaisseau de transit interplanétaire comportant également un atterrisseur habitat. Utilisation d'un moteur électrique, le SAMET (Solar Aqueous Microwave Electro-Thermal), qui expulse de la vapeur d'eau chauffée par des microondes et qui est alimenté électriquement par des panneaux photovoltaïques (500 kW). Production de kérosène et d'oxygène à la surface de Mars, en utilisant un petit réacteur nucléaire (comme dans Mars Direct) et le procédé Fischer-Tropp. Pour cela, on apporte 5 tonnes de H2 sur Mars et on produit environ 100 tonnes de LOX-RP1-1 et d'eau (l'eau servant au SAMET pour le retour). Au retour en orbite martienne, l'équipage effectue une jonction avec le vaisseau de transit qui est alimenté en eau. Il s'agit d'une proposition originale dans laquelle l'auteur propose de commencer par établir une base sur Phobos, afin d'y placer des réserves de carburant et de télécommander les opérations robotiques à la surface de Mars. Phobos jouerait ainsi le rôle d'une base de soutien pour les missions habitées sur la surface de Mars. Pour le transit de LEO vers Mars, il suggère une poussée en 2 temps, d'abord en propulsion chimique pour atteindre la vitesse de libération (3 km/s depuis LEO), puis en propulsion MET (Microwave Electro-Thermal) avec expulsion de vapeur d'eau (3 km/s supplémentaires pour atteindre Mars). La production d'énergie électrique est assurée par des panneaux solaires. Enfin, il propose de réduire l'équipage à 3 astronautes pour réduire l'IMLEO et faciliter la mission. Remarque préliminaire : il existe un grand nombre d'articles sur la propulsion électrique et dans bon nombre d'entre eux, il est suggéré que ce système de propulsion peut être exploité lors d'une mission martienne habitée. Ainsi, dans cet article comme dans beaucoup d'autres, il n'y a aucun détail concernant le nombre d'astronautes ou les autres phases de la mission. L'article est toutefois intéressant car on y présente une évaluation des différentes options de propulsion électrique pour des missions cargo ou habitées vers Mars. 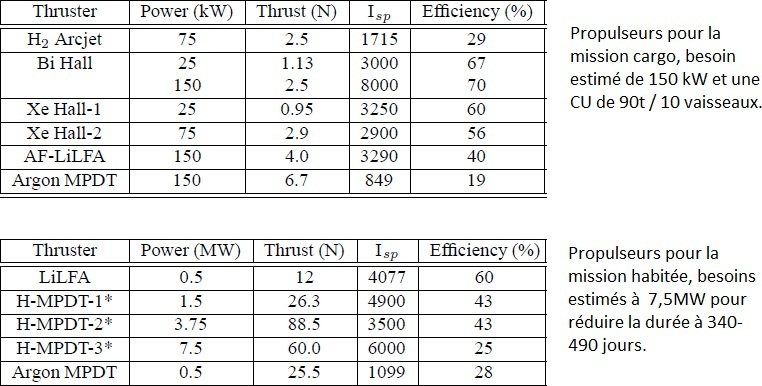 Les options étudiées sont les technlogies arcjet, l'effet Hall et les propulseurs MPDT (magnetoplasmadynamic thrusters). Pour 7,5 MW, 60t de CU (mission habitée), la technologie LiLFA (MPDT) est plus performante pour réduire la durée du voyage (tout de même 340 jours), avec un ration de masse d'ergols proche de 57% (129t). Pour 150 kW (mission cargo), les technologies LiLFA et Hall sont efficaces avec un ratio de masse d'ergols de 45% (7 à 8t). Le propulseur Hall améliore les temps de trajet (530-570 jours) par rapport à LiLFA (710 jours).